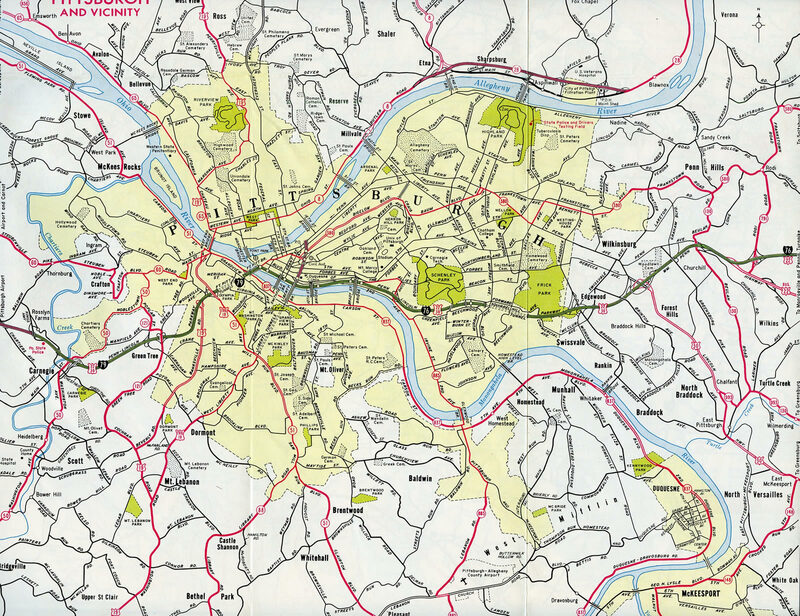 Interstate 376 originally ran along just the Penn-Lincoln Parkway East through Pittsburgh to the eastern suburbs of Edgewood, Forest Hills and Churchill. The freeway follows the Monongahela River initially, then turns away from the river via the Squirrel Hill Tunnel. 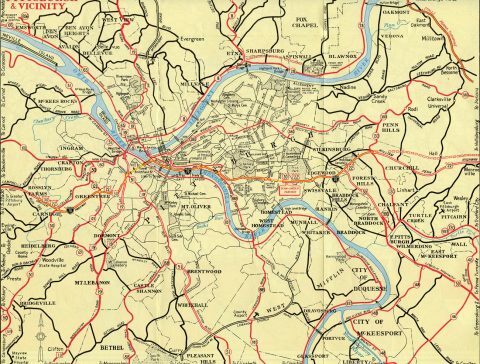 Often referred to as the Parkway East, the parkway predated the Interstate system as U.S. 22 & 30 to connect Pittsburgh with the Pennsylvania Turnpike mainline at Monroeville. In June 2009, the route was extended over Interstate 279 onto Parkway West to I-79 near Carnegie in preparation for its northward extension to Interstate 80 near Sharon. With that action, Interstate 376 carries U.S. 22 (William Penn Highway) for its entire length along the Penn-Lincoln Parkway, and U.S. 30 (Lincoln Highway) from Wilkinsburg to Moon Run. Both U.S. routes are well-signed (except that the continuation of U.S. 22 & 30 west onto the Fort Pitt Bridge is unmarked). Eastbound Interstate 376 (Penn-Lincoln Parkway West) & U.S. 22-30 enter the Fort Pitt Tunnel. 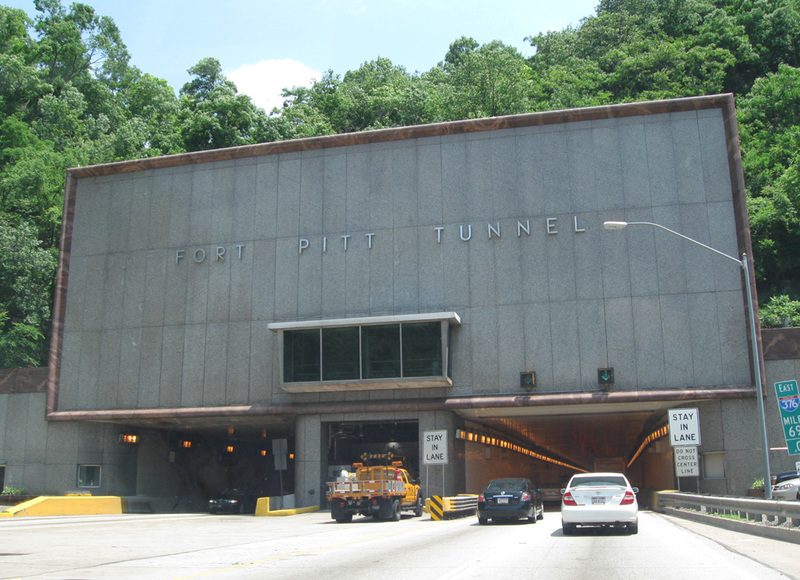 Totaling 3,614 feet in length,1 the tunnel passes under Mount Washington and emerges on the Fort Pitt Bridge. Photo taken June 12, 2010. Further extension of I-376 replaced the Pennsylvania 60 (Airport Expressway) from Robinson Township, around Pittsburgh International Airport (PIT), to Beaver Falls. Further lengthening of the route took place in November 2009, with Interstate 376 overlaying the tolled Beaver Valley Expressway, which is maintained by the Pennsylvania Turnpike Commission, and the New Castle bypass, to end at Interstate 80, five miles east of the Ohio state line. The expressway / arterial route of Pennsylvania 60 Business to Pittsburgh International Airport vicinity was redesignated Business Loop I-376 with the westward extension of the I-376 mainline. PA 60 otherwise was truncated north of I-376 and U.S. 22 & 30, leaving just a 9.4 mile route east to U.S. 19 in Pittsburgh. The 5.5 mile spur of PA 60 north from I-80 into Sharon was redesignated as Pennsylvania 760. Interstate 376 connects with Pennsylvania Turnpike 576 (Findlay Connector) near Penn Hills and Monroeville. PA 576 is the Southern Beltway, a planned toll road bypassing much of the Pittsburgh area to the south between I-376 near PIT Airport and Interstate 376 at Monroeville. The segment leading southwest from Interstate 376 to U.S. 22-30 (William Penn Highway) opened to traffic on October 11, 2006. Interstate 376 in its entirety is part of High Priority Corridor 79: Interstate 376; its designation was written into law. I-376 emerges from the Fort Pitt Tunnel through Mount Washington directly onto the Fort Pitt Bridge. The yellow tied arch bridge spans the Monongahela River east to Interstate 279 at the Point and Downtown Pittsburgh. The Monongahela River combines with the Allegheny River nearby to form the Ohio River. Photo taken 11/01/04. Opened to traffic on June 5, 1953, the Squirrel Hill Tunnel carries Interstate 376 & U.S. 22-30 under Squirrel Hill in Pittsburgh. The 4,225-foot, twin-tube tunnel bypasses the neighborhoods east of Beechwood Avenue and south of Forward Avenue.5 Each tube accommodates two lanes of travel. 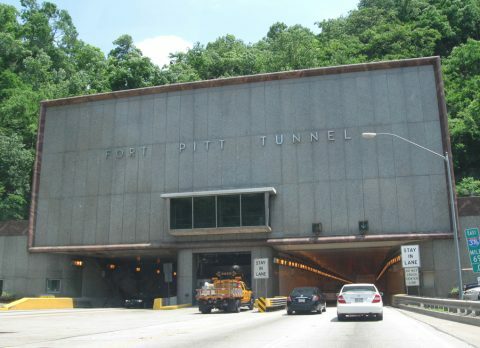 The tunnel is an integral link between Downtown Pittsburgh and Monroeville, where Interstate 376 meets the Pennsylvania Turnpike (Interstate 76). Photo taken November 1, 2014. Penn Lincoln Parkway West and East was initially included in the Interstate 70 mainline as it looped north through Pittsburgh from Washington to the Pennsylvania Turnpike at New Stanton. The current route of I-70 between Washington and New Stanton to the south was designated at that time as Interstate 70S while the PA Turnpike was labeled Interstate 80S. Several numbering changes were implemented by 1963, with I-70 shifted southward to its present alignment, Interstate 80S dropped from Monroeville east to Philadelphia and replaced with new Interstate 76, and Parkway West reassigned as the southern third of the Interstate 79 loop through Pittsburgh. 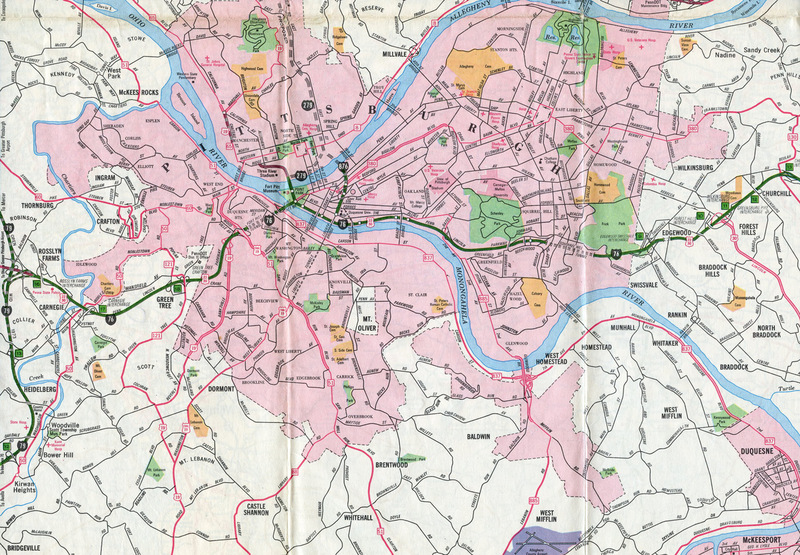 Changes approved by AASHTO on June 30, 1970 reassigned Parkway West as an extension of Interstate 76 in place of I-279 between the Fort Pitt Bridge and the new alignment of I-79 near Carnegie. 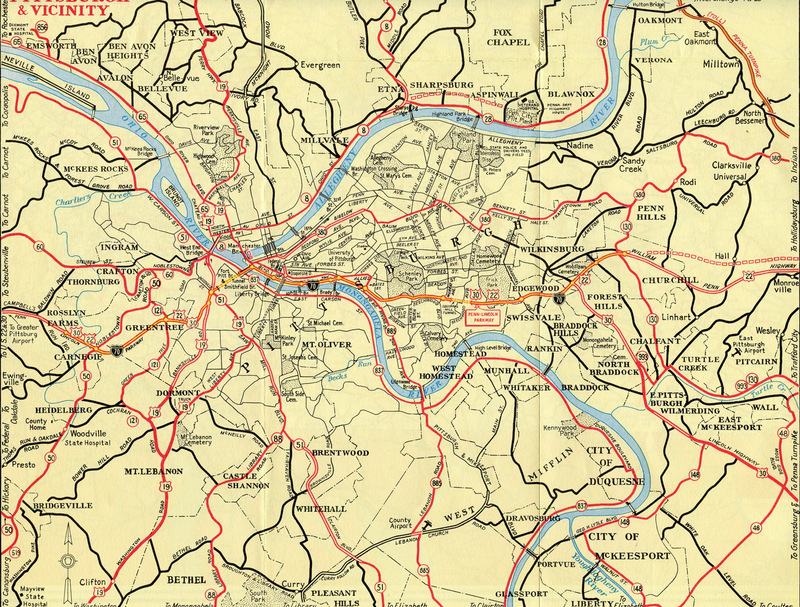 I-279 was redesignated along just the Fort Duquesne Bridge and unconstructed Parkway North. Also included in the 1971 application was the renumbering of Interstate 876 to 579, reflecting the change of Crosstown Boulevard from a complete loop into a spur with no direct connection to I-376. “To designate Pennsylvania State Route 60 and United States Routes 22 and 30 as part of the Dwight D. Eisenhower National System of Interstate and Defense Highways, and for other purposes. “SECTION 1. DESIGNATION TO INTERSTATE SYSTEM. Pennsylvania State Route 60 from Interstate Route 80 south to United States Routes 22 and 30 Interchange at Steubenville Pike, Pennsylvania, and United States Routes 22 and 30 from Pennsylvania State Route 60 Interchange to Interstate Route 79 are designated as part of the Dwight D. Eisenhower National System of Interstate and Defense Highways as Interstate Route 376. Any segment of such routes shall become a part of the Interstate System at such time as the Secretary of Transportation determines that the segment meets the Interstate System design standards approved by the Secretary under section 109(b) of title 23, United States Code. On the date of the Secretary’s determination, such routes shall be designated as Interstate Route 376 and the State of Pennsylvania shall erect signs identifying such routes as segments of Interstate Route 376. Note that this bill as written would have created an overlap between Interstates 279 and 376 along the Parkway West and that almost all of Pennsylvania 60 would become part of Interstate 376 (along with portions of U.S. 22-30 and U.S. 422 near New Castle). By adding this mileage, Interstate 376 would nearly triple in size, and intersect its parent (Interstate 76 / Pennsylvania Turnpike) twice. Category 1 — improvement of several sub-standard features of the 90-mile corridor, including guide-rail and median barriers, sign and lighting placements, and right-of-way fences. Cost: $21.8 million. Category 2 — improvement of deficiencies that required final designs to be completed and have funding in place for construction. This included the replacement of several older, button copy signs in Beaver County and Lawrence County. Cost: $12.4 million. Category 3 — these projects included an improvement to the cloverleaf interchange along the Parkway West at Routes 22, 30 and 60 in Robinson. Cost: $57.2 million. Category 4 — consisted of design deficiencies that would cost an estimated $83.1 million to correct but which the FHWA would not require, provided PennDOT makes a case for the exceptions. Some officials wanted to see the Interstate 376 designation approved by the FHWA immediately, with a subsequent commitment to address those issues over time. The rational behind an extended I-376, was that travelers to the region would benefit from the reduced confusion that a single route number over the 90-mile corridor would provide. 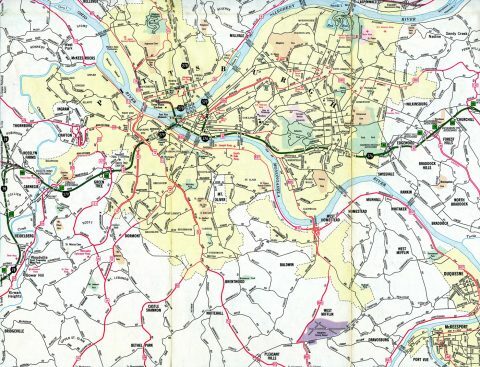 Additionally, supporters touted the potential economic development along a simplified route in place of the previous six routes between Sharon and Monroeville.8 A third benefit cited was that a single route number (I-376) would ease directions to Pittsburgh International Airport (PIT). (I) IN GENERAL.-The routes referred to in subsection (c)(79), except the portion of Pennsylvania Turnpike Route 60 and United States Route 422 between Pennsylvania Turnpike Interchange 10 and Interstate Route 80, shall be designated as Interstate Route 376. (II) SIGNS.-The State of Pennsylvania shall have jurisdiction over the highways described in subclause (I) (except Pennsylvania Turnpike Route 60) and erect signs in accordance with Interstate signing criteria that identify the routes described in subclause (I) as Interstate Route 376. (III) ASSISTANCE FROM SECRETARY.-The Secretary shall assist the State of Pennsylvania in carrying out, not later than December 31, 2008, an activity under subclause (II) relating to Interstate Route 376 and in complying with sections 109 and 139 of title 23, United States Code. Interstate 376 would require some upgrades to make it fully Interstate compatible. PennDOT and the FHWA negotiated the terms by March 2006 to bring the complete route to Interstate standards. These upgrades, along with new signs with the new designation, would cost approximately $45 million.9 Improvements were targeted for approximately ten interchanges, specific median and guardrails, and signage. Plans called for Interstate 279 to end at the Fort Pitt interchange Downtown, and Interstate 376 (and U.S. 22-30) to be signed solely along the route of I-279 along Penn-Lincoln Parkway West. Signs advertising Future Interstate 376 were planned for installation by May 2006, with the resigning of Parkway West to I-376, contingent upon funding availability, envisioned for 2008. Interstate 376 & U.S. 22 part ways just beyond the Haymaker Road off-ramp (Exit 84B) to the borough of Plum. Two lanes depart for William Penn Highway while a slip ramp joins an adjacent on-ramp (Exit 85) to the Pennsylvania Turnpike access road. Signs pictured here for U.S. 22 and Plum remain in use as of 2015. A replacement for the Exit 15 overhead now references Ohio and Harrisburg and was renumbered to Exit 85. Photo taken 10/01. Traffic splits with U.S. 22 joining William Penn Highway to Murrysville and a single lane ramp combining with the U.S. 22 Business eastbound on-ramp to Interstate 76 (Pennsylvania Turnpike). There was an end shield for I-376 posted here previously. Photo taken by Jeff Kitsko (03/01). Long since replaced, these button copy were posted just beyond the Monroeville toll plazaon the PA Turnpike access road. I-76 shields were added to these signs well after their installation, as the panels predated the full signing of the Interstate route on the cross state toll road. Photo taken 10/01. A trumpet interchange joins the I-376 access road with Interstate 76 (Pennsylvania Turnpike) leading northwest to Youngstown, Ohio and east to the capital city of Harrisburg. Green outs updated the sequential exit numbers here when the state converted to mileage based exits. Photo taken 10/01. Two miles north of the trumpet interchange (Exit 57) and access road joining Interstate 76 with Interstate 376 (Penn Lincoln Parkway East) west and U.S. 22 (William Penn Highway) on the Pennsylvania Turnpike eastbound. Photo taken 09/30/10. Interstate 76 enters the borough of Monroeville by an industrial park on the one mile approach to Exit 57 with Interstate 376 west and U.S. 22. Photo taken 09/30/10. Exit 57 leaves Interstate 76 (Pennsylvania Turnpike) east after the toll road crosses over U.S. 22 (William Penn Highway). U.S. 22 east travels at grade to Murraysville. The US route west combines with Interstate 376 along Penn Lincoln Parkway West through Murraysville and Pittsburgh. Photo taken 09/30/10. Ramps from both directions of the Pennsylvania Turnpike to I-376 & U.S. 22 expand to two lanes, expanding the access road to four lanes ahead of the Exit 57 toll plaza. Photo taken 09/30/10. Vacating the toll plaza, drivers enter a trumpet interchange with U.S. 22 east and U.S. 22 Business west. Photo taken 09/30/10. U.S. 22 shifts from William Penn Highway onto Penn Lincoln Parkway East via a wye interchange located within the exchange linking I-376 with U.S. 22 Business. A slip ramp forms the beginning of Interstate 376 as traffic combines with U.S. 22 west. Photo taken 09/30/10. The first sign for Interstate 80 (Exits 1B/A) on I-376 west appears within the diamond interchange (Exit 2) with PA 18 outside West Middlesex. Photo taken 06/10/10. Forthcoming Interstate 80 travels a rural route for 311 miles across northern Pennsylvania, joining smaller cities, boroughs and towns from Sharon east to Mercer, Clarion, Dubois, Bloomsburg and Stroudsburg. Photo taken 06/10/10. The half diamond interchange with PA 318 just south of I-80 was expanded to include new access from I-376. A $4.949 million contract built the new Exit 1C from March 10 to October 2014.15 Exit 1B follows just to the north for Interstate 80 east to the nearby Mercer County seat. Photo taken 06/10/10. An end I-376 and begin PA 760 shield assembly stands within the full cloverleaf interchange at Interstate 80. PA 760 replaced the northernmost extent of PA 60 when I-376 was designated in 2009. Photo taken 06/10/10. Exit 1A loops away from the ending Interstate 376 to I-80 west for Youngstown, Akron and Cleveland, Ohio. Pennsylvania 760 veers west to adjacent PA 18 for motorists headed to the city of Hermitage. Photo taken 06/10/10. Pennsylvania 760 transitions from two-lane road into a freeway at the parclo interchange with Pennsylvania 18 in Hermitage. The route quickly enters the cloverleaf interchange from there with Interstates 80 and 376. Photo taken 09/30/10. Interstate 376 takes over for the ending Pennsylvania 760 along the Beaver Valley Expressway leading south to New Castle. Photo taken 09/30/10. Exits 1B and 1C depart in quick succession from the initial stretch of I-376 east for Interstate 80 east to Mercer and State College and Pennsylvania 318 into the nearby borough of West Middlesex. Photo taken 09/30/10. Two miles ahead of Exits 4B/A for Pennsylvania 760 north to Sharon and Interstate 376 south to New Castle on I-80 west. Photo taken 09/30/10. Pennsylvania 318 passes under Interstate 80, a mile ahead of the full cloverleaf interchange (Exits 4B/A) with Interstate 376 and Pennsylvania 760. I-376 and PA 318 meet just south of I-80 by the borough of Middlesex. Photo taken 09/30/10. Pennsylvania 760 spurs north from Interstate 376 as a freeway to nearby Pennsylvania 18 (Hermitage Road) and a surface route into the city of Sharon. Photo taken 09/30/10. Exit 4A loops onto Interstate 376 (former PA 60) south. I-376 follows the Beaver Valley Expressway to New Castle, Beaver, Moon Township and Pittsburgh International Airport (PIT). Photo taken 09/01/05. Beyond Exit 1C with Grant Street, I-376 & U.S. 22-30 west approached Exit 1B for Stanwix Street, which connects to the western end of the Purple Belt that encircles Downtown Pittsburgh. What was the final exit from Interstate 376 west was the connection to I-279 north to the North Shore (Exit 1A) and southwest to the airport. Photo by 11/02/04. Passing under Smithfield Street, drivers saw this button copy sign advising to use the left lane for Interstate 279 south across the Fort Pitt Bridge. This sign was carbon copied with Clearview font to display Interstate 376 west in 2009. Photo taken 11/02/04. A third westbound lane accompanied Interstate 376 & U.S. 22-30 west from the Grant Street on-ramp. Back to back ramps followed for Stanwix Street (Exit 1B) and Interstate 279 north (Exit 1A). This configuration is the same for I-376 today, but with new exit numbers (Exits 70D/C). Photo taken 11/02/04. Exit 1B ascended from Interstate 376 west as the last off-ramp for Downtown as the route defaulted to Interstate 279 and the Fort Pitt Bridge east end. Photo taken 11/02/04. U.S. 22 & 30 transitioned from the ending I-376 west onto I-279 south across the Fort Pitt Bridge to Mount Washington. Sign replacements made by 2009 continue to omit the US routes, but added an exit only sign for I-279 north (Exit 70C). Photo taken 11/02/04. Narrow ramps concluded Interstate 376 west at Interstate 279. The overhead for I-279 here was renumbered to Exit 70C but otherwise carbon copied. The remainder of I-279 travels its original route to North Shore destinations via the Fort Duquesne Bridge. Photo taken 11/02/04. A pair of end shields were posted on the transition ramp from I-376 west to the Fort Pitt Bridge (I-279 south) until 2009. The end banners were replaced then with west banners, but the bubble shields remained in place. Prior to 2002, both assemblies included state-named shields. Photo taken 11/02/04. Interstate 279 south at I-376 & U.S. 22-30 (Penn Lincoln Parkway East) was numbered as Exit 8 originally, then Exit 6A when mile based exits were implemented across the Keystone State. With the truncation of I-279 here, the left-hand ramp for Monroeville is now unnumbered. Photo taken 10/01. Reconstruction of the Fort Pitt Bridge and an adjacent section of Parkway West through 2003 replaced this stretch of viaduct taking travelers from the Fort Duquesne Bridge south onto the then-eastbound beginning of Interstate 376. Photo taken 10/01. Interstate 279 split with the eastbound beginning of I-376 just east of the forthcoming Fort Pitt Tunnel. This set of overheads was replaced following the renumbering of Parkway West to Interstate 376. Exits were renumbered and the pull through panel for I-279 was replaced with a one-mile sign referencing North Shore. Photo taken 10/31/04. Interstate 279 north & U.S. 22-30 traveled the upper deck of the Fort Pitt Bridge directly east from the Fort Pitt Tunnel to Exits 6A-C for Interstate 376 (Penn Lincoln Parkway East) and two Downtown / Golden Triangle exits. Sign changes here added an exit only placard for I-279 north (now Exit 70C) and two pull through arrows for what was Exit 6A for I-376 east. Photo taken 10/31/04. The Fort Pitt Bridge partitioned with two lanes for Interstate 376 & U.S. 22-30 east (Exit 6A0, a single lane for Boulevard of the Allies (Exit 6B) and two lanes for Interstate 279 north and its off-ramp (Exit 6C) for Fort Duquesne Boulevard. This configuration remains the same with I-376 as the through route. Only the exit numbers have changed to Exits 70C-A. Photo taken 10/01. 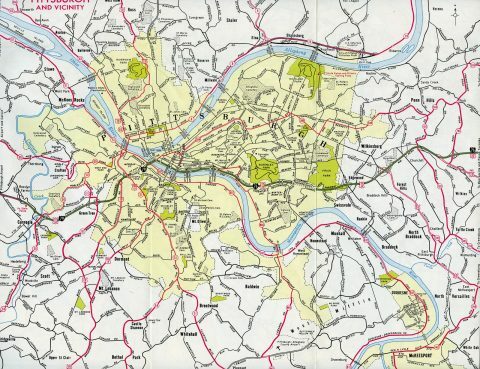 "250 Years of Pittsburgh History." Pittsburgh Post-Gazette, March 18, 2008. 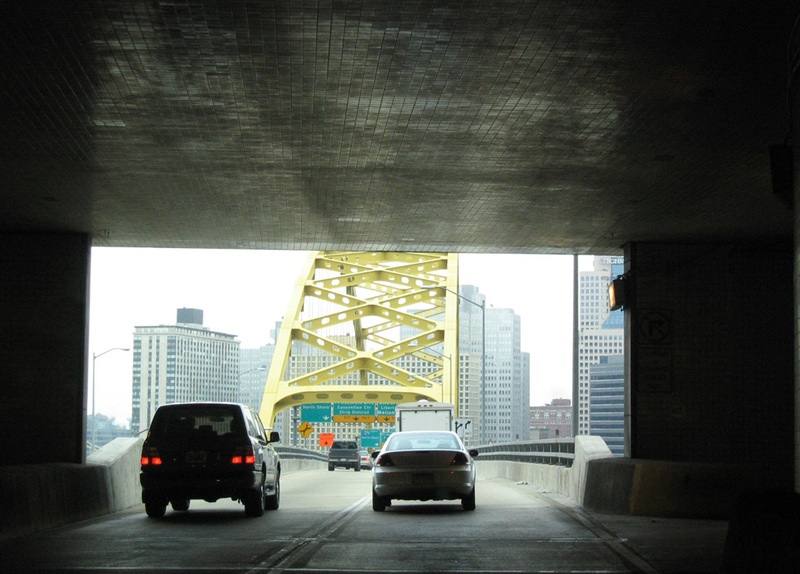 Fort Pitt Tunnel – Bridges and Tunnels of Allegheny County and Pittsburgh, PA (Bruce S. Cridlebaugh). "Tunnel Fun Facts." Pittsburgh Post-Gazette, March 31, 2002. 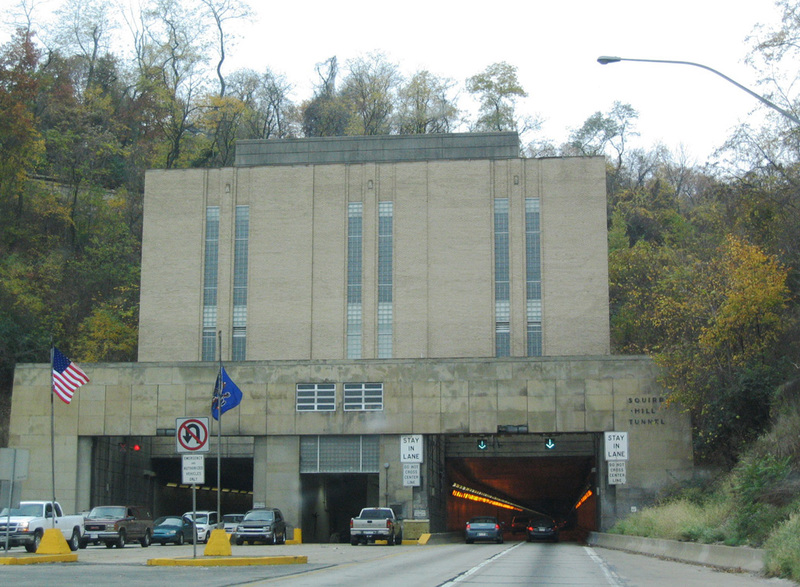 Squirrel Hill Tunnel – Bridges and Tunnels of Allegheny County and Pittsburgh, PA (Bruce S. Cridlebaugh). "Cost to unify I-376 pieces into one: $91 million", Pittsburgh Post-Gazette, May 17, 2005. "Feds close to ruling on making road I-376." Pittsburgh Post-Gazette, May 16, 2004. "Plan to turn 60 miles of roads into I-376 advances." Pittsburgh Post-Gazette, September 18, 2003. "PennDOT says cost for I-376 redesignation reduced", Pittsburgh Post-Gazette, March 20, 2006. "Parkway West becomes Interstate 376." Pittsburgh Post-Gazette, June 10, 2009. "Changing signs do a number on Parkway West drivers." Pittsburgh Post-Gazette, July 16, 2009. "It&apos;s Official: I-376 Corridor Christened." Pittsburgh Post-Gazette, November 7, 2009. "PennDOT&apos;s Route 22/30/60 Interchange Reconstruction Earns Diamond Award Certificate for Engineering Excellence." Pennsylvania Department of Transportation, press release. March 5, 2012. "Effective August 1 New Signage Marks Turnpike 60 Conversion to I-376." Pennsylvania Turnpike Commission, press release. July 26, 2010. "Interstate 376, Route 318 Ramp Construction to Begin in Mercer County." Pennsylvania Depart of Transportation, press release. March 5, 2014. Page updated August 17, 2016.